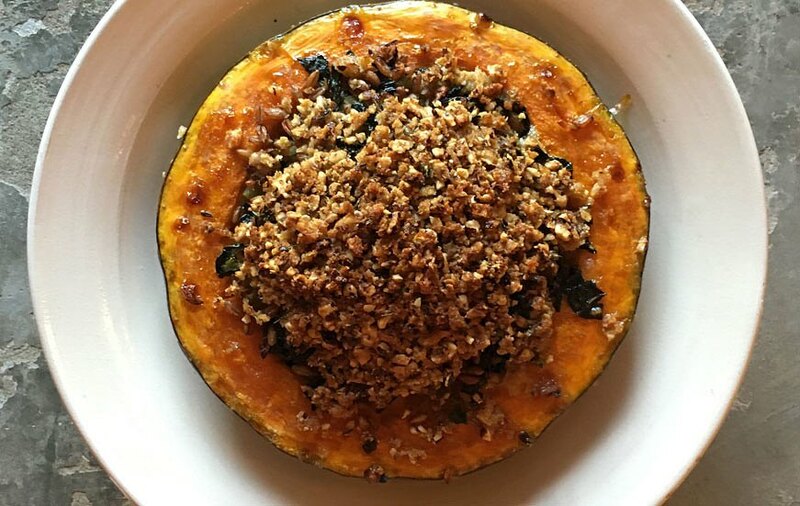 Roasted Crown Prince Squash with Spelt, Cavolo Nero & Tunworth. Start by rinsing the spelt. Cover generously with water like you would cook rice (or light vegetable stock) and simmer gently over a medium heat for 24 minutes, until plump and tender. Once cooked, drain and allow the steam to billow off. Preheat the oven to 190ºc and line a baking tray with parchment paper. Meanwhile, wash and dry the squash (as we won't be peeling it), and cut it in half across the middle. 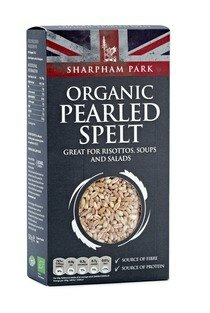 Soup out the seeds, but leave any stringy bits as these have great flavour! Very finely dice the onion and the celery, and finely chop the rosemary. Heat a little rapeseed oil, or butter, in a medium saucepan and sauté these for 8 minutes; if they catch and brown a little this is more than okay, it will add great depth of flavour. Meanwhile, rinse the cavolo nero, or other kale, and coarsely chop, removing any thicker central stalks if needs be. Add this to the onions and celery, and stir. Season with salt and pepper. Add a small splash of boiling water - just a few tablespoons - and put the lid on the saucepan. Steam-fry for 2 minutes, until the cavolo nero has started to wilt. Add the cooked spelt and stir well, then turn off the heat. Chop or tear the tunworth, including the rind, and fold this through the spelt mix. Rub the hollowed squash with rapeseed oil both inside and out, and season generously with salt and pepper. Place on a lined roasting tray, and then divide the spelt filling between the two hollowed halves. For the topping: roughly chop the hazelnuts, and mix these with the bread crumbs, the grated Parmesan, lots of fresh thyme leaves, 2 tablespoons of oil, and salt & pepper. Alternatively this can all be whizzed in a food processor. Spoon this sandy, crumbly mix on top of each squash, patting it in place to help it stay put. Roast in the preheated oven for 1 hour, or until the squash is beautifully soft; check after 20 minutes and if the top is browning too quickly, perhaps turn the oven down slightly, or loosely cover the top with tin foil. A squeeze of lemon juice and a drizzle of olive oil are brilliant final touch before serving.